And then, the 'clear ip ospf process' for this change to take effect. Do clear the ospf on both R1 and R3. Extend OSPF area 0 to include R6 to SW4 connection. Advertise loopback0 of SW4 into area 100 (as per pic.1 above). 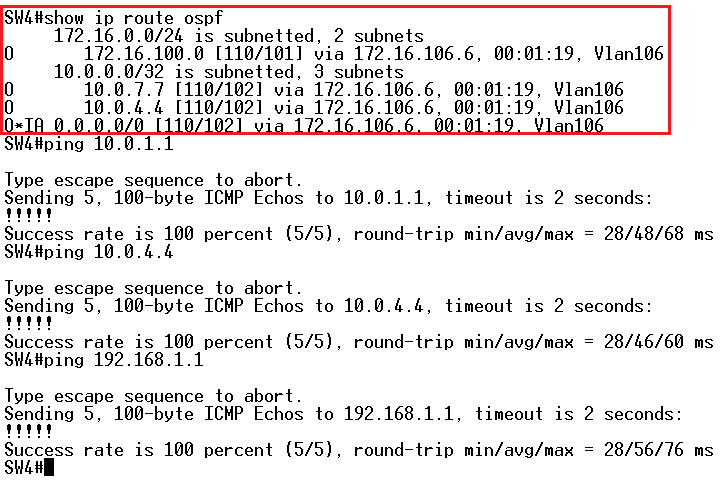 Reduce the size of the routing table in OSPF area 100 so that external and inter-area prefixes are represented by default route. Do not use any filtering tool such as ACL, prefix-list, etc. Use Cisco proprietary feature to accomplish the task. What is the difference between this solution and the one used in the previous lab? Do all routers have to be Cisco devices to solve the problem presented in this lab? This lab runs on GNS3 emulator. In case you use real layer3 switch, you should start with enabling routing for IPv4 first ('ip routing' command in the global config mode). Pic. 2 - R6 Current OSPF Neighbors. Pic. 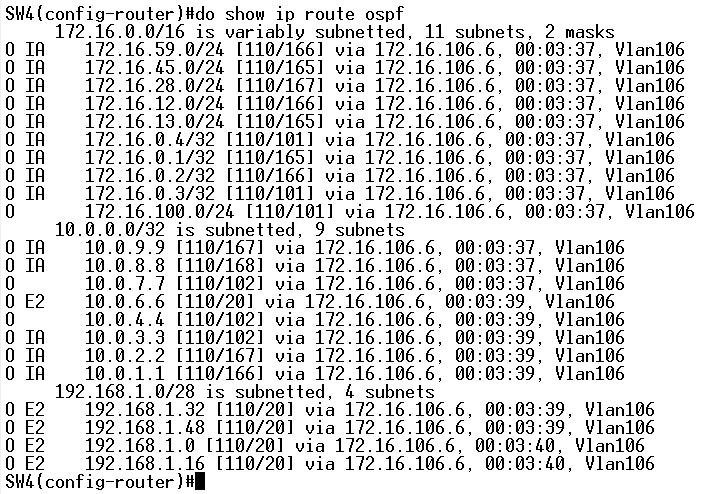 3 - SW4 OSPF Routing Table. All routers in OSPF area 100 accept all types of LSA right now. Pic. 4 - SW4 Routing Table and Connectivity. Cisco implemented additional ABR filtering in IOS called totally stubby area. This feature allows to reduce the size of the routing table by filtering external (just like in stub area) as well as inter-area prefixes. An ABR is injecting the default route instead to allow connectivity to filtered prefixes. Totally stubby area is a Cisco feature, so ABR routers must be Cisco devices to use it. The routers within the totally stubby area do not have to be Cisco devices.